Dan and Ed are back on the road, destination: Kamchatka, Siberia! Ed’s chosen motorcycle is Yamaha’s technical marvel, the WR250R. Featuring 250cc of single cylinder fourstroke-powerhouse, an aluminium beam frame, fuel injection, mighty 350W of electrical output for heated clothing and charging gadgets, sturdy steel subframe, a modest 90mile range as standard, an even more modest 29hp engine and a tiny chasis weighing in around the 130kg wet weight. This bike was first produced in 2008, sold well in the US and Australia and is available in both dirtbike (R) or supermoto (X) guises. Sadly discontinued in the UK owing to the staggering OTR price of over £5000 for a 250, Ed snapped this up for half the price in 2009 from a Polish guy in North London. Convinced by the growing number of followers on motorcycling forums such as ADVrider.com that this could be the perfect platform for an overlander, and following on from Chris Bone’s successful MotocrossAfrica trip in 2007 on a small cc dirtbike, Ed proceeded to read up as much knowledge as possible with the view to using it on a trip of this nature. 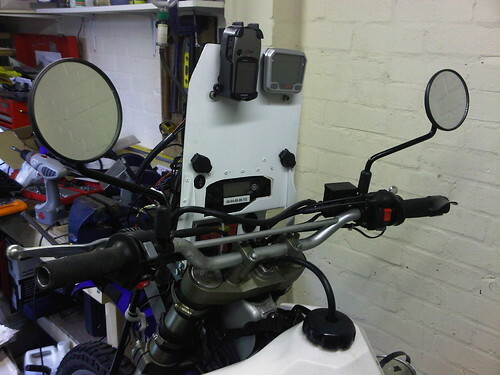 The range was increased from 100 to 200miles using a Safari 14Ltr tank from Alex at CoreRacing. This takes capacity from 7Ltrs to 14Ltrs. A chinese, rubberised fuel bladder was rolled-up and tied to the luggage to give a further 100miles from its 7Ltrs, as and when required. A genuine Yamaha rear rack was added to allow the bike to carry the luggage but with no traditional panniers being used, no cumbersome racks were needed. Footpegs were changed for wider ‘ebay’ chinese versions and Rox ‘anti-vibration’ bar raisers with aluminium magura bars implemented to give a more relaxing riding position than standard. In the final version of the bike, the original bars were re-used along with RFX solid 30mm risers because they performed better in order to minimise the vibrations. 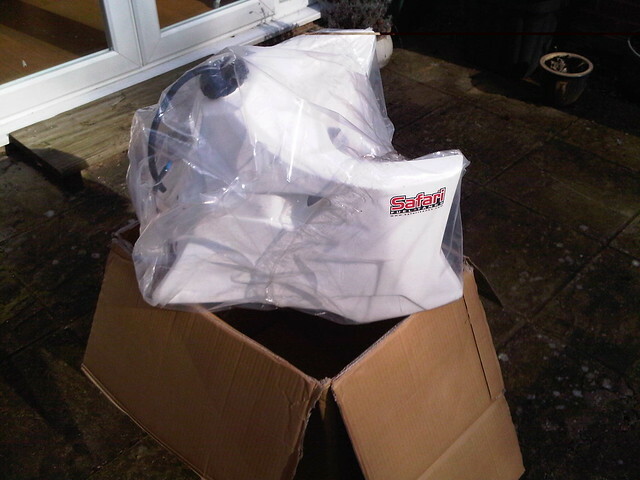 Rallye fairing and mapboard – purchased fairing but with DIY brackets. 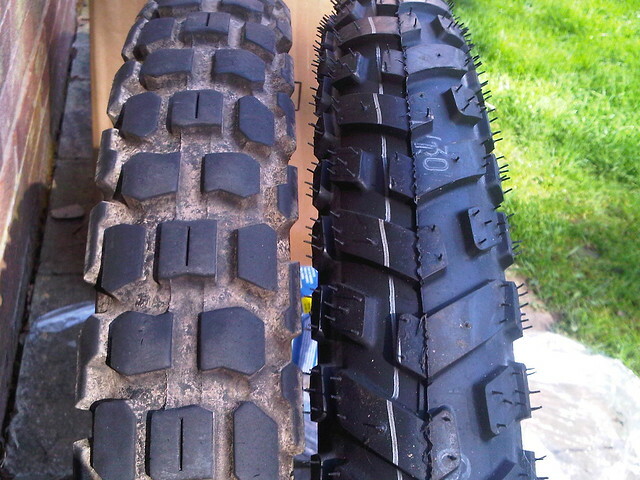 Heidenau K60 tyres were added to replace the adequate (and much maligned on the internet) Bridgestone Trailwings. These were bought from Oponeo, a company in Poland that were the cheapest I could find and arrived in a couple of days. The aim was to replicate some of the successes of the previous Brighton2Capetown trip and to be able to achieve at least 10,000miles from a set. 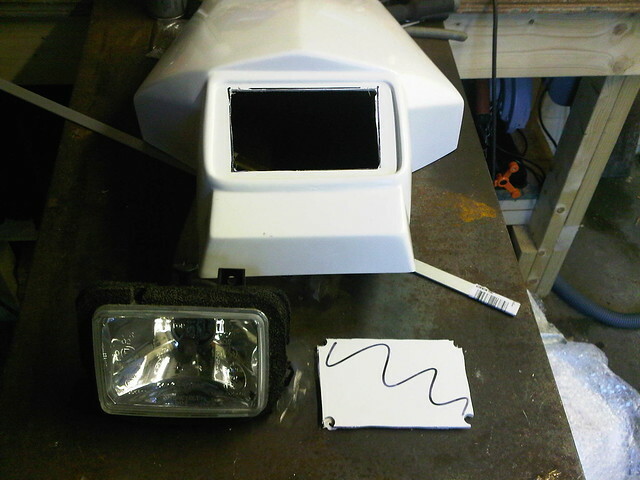 A flatlands racing skidplate, scotoiler for better chain life, Sandman’s casesaver kit (to allow me to run a larger front sprocket and mitigate damage to the engine casing if the chain fails) and two DIN electrical sockets to allow me to run MP3 player, radios, chargers and heated vests. An Acewell digital dash was also considered because the WR has a Kph speedo and no rev-counter or voltmeter. It was duly added to the rallye mapboard but left off the final version due to complexity and the lack of mounting options without the mapboard in place. 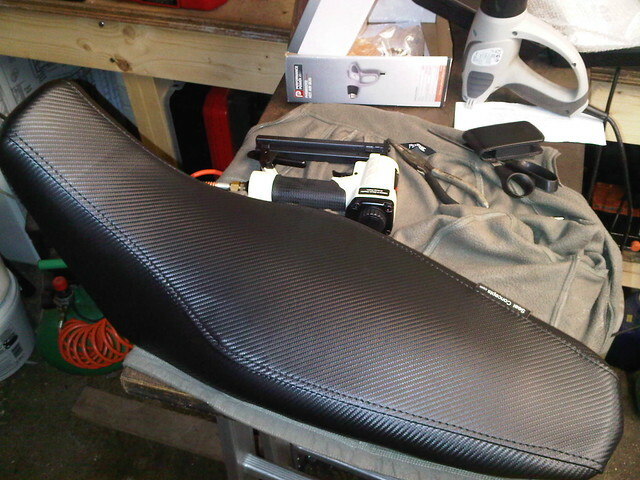 Finally, a much needed seat rebuild was completed using a SeatConcepts kit from the USA. Easy to do and the kit comes with a new cover and new, wider foam. Preventative action was also needed for the fuelpump. Yamaha never did a full recall instead preferring to allow dealers to replace them adhoc as well as behind the scenes changing the motor in the pump for future bikes. Affected models were those 2008 bikes in the 1st quarter of that year and not all bikes suffer from the failure. 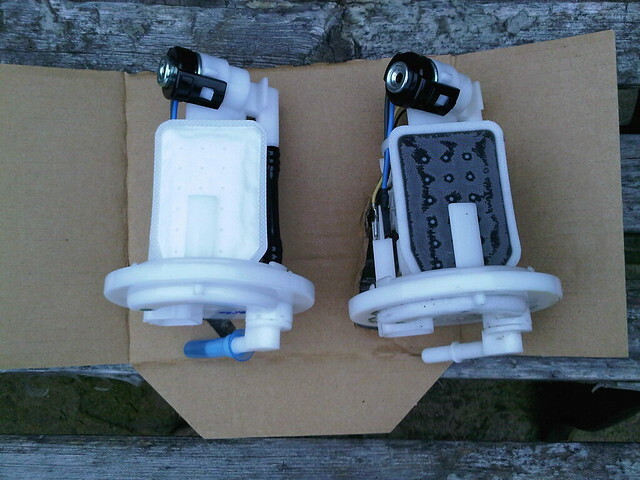 To be safe Ed replaced his, perfectly good pump, with a new replacement from the USA (in the UK they are £300+VAT). Luggage consisted of Giantloop Coyote, in black, Wolfman Expedition tankbag, Ortlieb roll-bag (red) and a Kriega R15 rucksack with 3Ltr hydration bladder. I am very interested in what modifications you have done to the WR, as I’m interested in picking one up for a very similar trip(s) as to your Siberia excursion. Primarily, my concern/interest is what you’ve done for oil temperature reduction, over days of prolonged riding. I’ve been told (by experienced mechanics) that I should not choose something like a WR or CRF due to the oil capacity, and as I have no longterm firsthand experience with bikes of this small a displacement, and their reliability. We were in white ToyotaSurf on board of an Ural truck.You were discussing something when we arrived at the crossing and then you sped forward across the railway bridge. And we followed soon fording the river still in the truck. Last year we bumped into the blog post A Mini (Baikal) Adventure. We saw Alistair in some of the pictures. We met him twice. First time at Blue Creek on July 25. The water swelled after heavy rains and we had to wait for it to fall off for two days. On the second day there we noticed a biker. He stood out from the crowd by being an obvious traveler. Especially, by the way he looked. Soon he moved forward across the railway bridge. It’s so good to travel by bike. Next time we are travelling by bike too. On the following day we met him on an empty “road” in taiga. He was trying to repair a tire puncture. He ran out of glue. We stopped and helped him to fix it, pumped it up and gave him some spare glue. And apart from the glue, we left him with our signatures on his bike. He caught up with us at the Vitim crossing. You have a picture of this river in the background to the post. Alistair sped forward and we never saw him again. Perhaps, you know how to contact him or how to find him. It’d be so great to find out more about the rest of his journey and where he is now. Thanx for sharing. Just wondering if you had done and suspension or frame mods/reinforcements? I was thinking it might be nice to reinforce the rear sub-frame. Did you have any suspension issues and do you have any recommendations?? It didn’t even cross my mind. 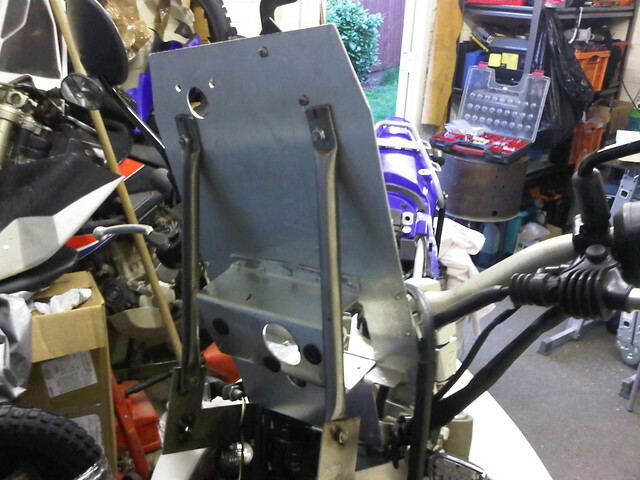 The subframe itself is plenty strong enough with thick lugs and adequate welds. The main concern is simply not to load it up too much – the rear shock is really soft/squidgy. This gives it nice smooth ride on the road but brakes/accelerator use does get the whole thing pitching forwards and backwards a bit too much. 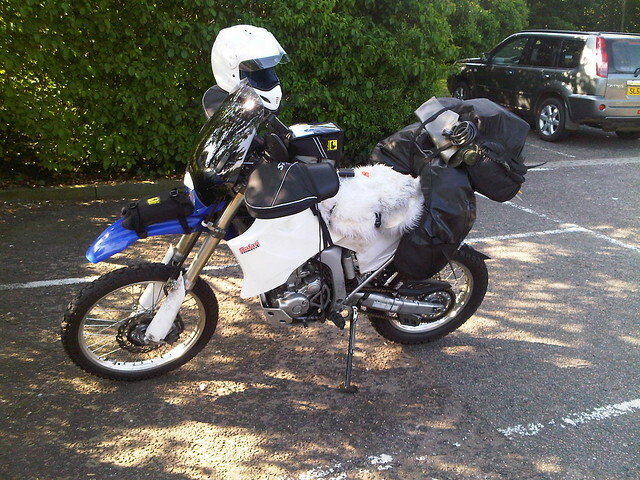 That being said, it is a really good compromise for a travel bike. You’ll see from the blog that I only had 30-something kg of kit on the back rack/coyote bags so bearing in mind it can take another person I don’t think I was too close to the limit. I did take the pegs off though, mainly to dissuade people from trying to jump on the back for a lift which would have been impossible with the bags there but it doesn’t stop drunk locals etc. from having a go. No other suspension issues apart from a slightly weepy front fork seal that I caught early with some film and had no more issues with. Overall, I was really pleased with my choice. I am starting to plan a trip from the US to and around South America that might eventually evolve into a RWT. I am in the planning phase and was leaning toward picking the wr250r. The other main contender would be dr650. 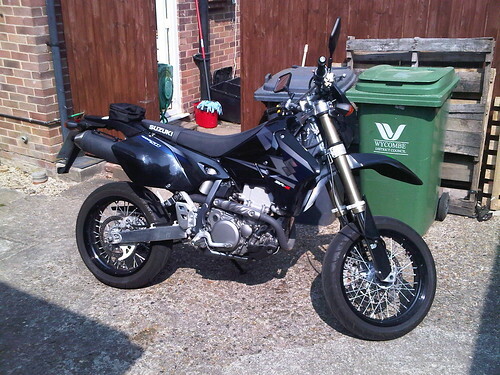 I have read great things about the wr250r and it seems to be quite capable. One of the concerns that I have is fuel quality and low octane fuel. With the high compression engine, Yamaha recommends high octane fuel in the wr250r. My concern would be running the bike on low octane fuel when high octane was not available, particularly in the heat with the bike under strain. Did you have any experience with this during your trip? Any feedback would be appreciated. Just do it! The WR-R is one of the nicest, high quality, well made, reliable small bikes ever. It may only be a 250 but it is capable of so much more! The octane problem is not an issue that I encountered. I never saw the piston but I figure it would look very healthy despite the odd tank of low octane fuel. I’m wondering on your current opinion of the wrr. So far I’ve done two bike trips and both on 650. I’ve currently also got a drz400e for the local trails but I’m now thinking that I can consolidate both my bike with the wrr. That six speed gear box looks like it will allow for the adventure riding stuff on the roads and the trails. The drz can’t do both those I feel. I’d take it across the African back roads setup much like yours. Did you ever feel you should have gone bigger. Maybe across the European sealed roads? Happy to share my findings if my response isn’t too late. 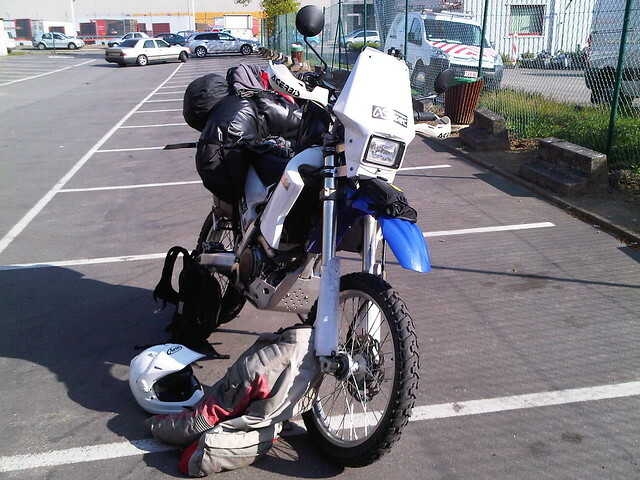 The WR is an incredibly capable motorcycle that you can ride across Europe on motorways, glide along the crumbling roads of central Asia, ride all day across the steppe in Mongolia and then lift single handedly (and still laden with your luggage) from a muddy bog on the Road of Bones. The quality of the finish and the feeling you can take on anything you encounter raises a smile every time you look at it. This vast capability exposes its Achilles heel and this sums it up for me: consider this, it is most at home riding hard pack dirt roads and moderate trails and only really lightly loaded. Does that sounds like an Overlander? Maybe and if you can live day-in and day-out on a trip with almost no luggage for weeks or months on end then I think it qualifies. A couple of points you raise, firstly Africa : yes. A WR would work especially well because an Africa trip needs less clothes, less tent, smaller sleeping bag than a Russia trip because the weather is so much better and that keeps luggage smaller. Did I sometimes wish that I had gone bigger? Yes but I didn’t find the WR uncomfortable just that a bigger bike often gives a smoother more relaxing ride but there’s more from overlanding that turning out 500mile days. My longer day was 1000miles from the Belarus border to Calais so it can be done! I stand gratefully corrected. Yes, Mrozy. A lovely place in Poland just off the mainroad before Minsk Mazowiecki where I was rescued from the dark storm clouds! Interested in the Yam for sale on the HUBB. Make contact please. What sort of ballpark price?